In the world of Linux distros, there are so many to choose from. It’s a really nice thing that I came across Modicia O.S. If you’re a multimedia enthusiast, this is a must-have for you. 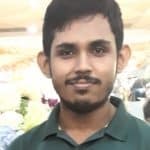 Almost all the Linux systems, being an open-source software, makes it really easy for customizing and tweaking that allows devs create different distros anytime they want. All of the distros have their own purposes. 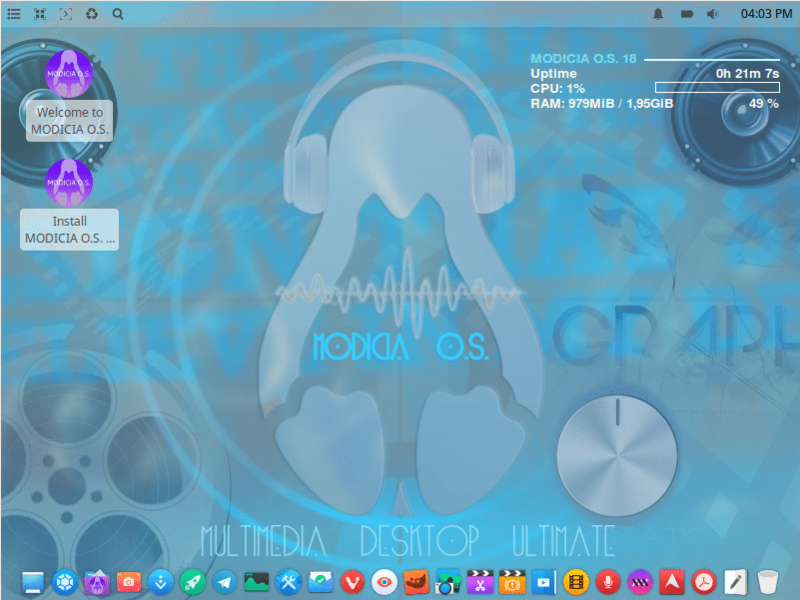 In the case of Modicia O.S., it’s basically for multimedia users, but it’s suitable for everyone. This Linux distro is the brainchild of an Italy-based community. The distro is mostly a general purpose computing platform that works just out of the box. The operating system is based on Xubuntu and also features the mid-weight Xfce with more spice. They call the desktop environment Anabolized Xfce – a greatly modified version of Xfce4. Before going deeper into the system, you also need the way to enjoy this awesome distro, right? You can download Modicia O.S. from their official site. Currently (the time of this article), the latest version of Modicia O.S. is Modicia O.S. 18 Long Term Support. You can get the ISO in x86_64 format. As the system is based on Xubuntu, it should run on a 32-bit system but not guaranteed 100%. Modicia O.S. is purpose-built for those who love working with audio and video. It comes up with a built-in library of top-notch free software for everything – graphics, audio and video performance with interactive menus. Modicia is also a complete package of all the necessary apps. It doesn’t require connecting with the internet during installation and you can enjoy the installation just out of the box. The desktop environment, as it’s derived from Xfce, represents a simple and uncomplicated view. Combined with its ultimate collection of software, this can truly be called the “ultimate” distro for anyone. And a lot more. The only thing I didn’t get was an IDE for my programming. It’s nothing big of a deal as the primary target of Modicia O.S. is for multimedia. Don’t worry if you’re an everyday normal user. Modicia O.S. will ensure a very satisfactory experience. Are you a power user? Love playing with sound? Have the fun in your way with Qtractor, Mixxx and the ZynAddSubFX Synthesizer. Inkscape, Krita etc. are also ready to fulfill your demand for top-notch graphics works. Confused about the purpose of an application? From the menu, find out the app’s name and hover your cursor over the app – very simple. This is the interface of Modicia O.S. Here, the interface looks quite familiar, right? It’s similar to macOS docking system. The desktop array is mostly a hybrid concoction as it seems, but that’s not the case. At the top, you’ll notice a fully functional panel bar – just like Xfce. At the bottom (the dockings), things are also in order quite well. At the left, there is the main menu and app finder/launcher. 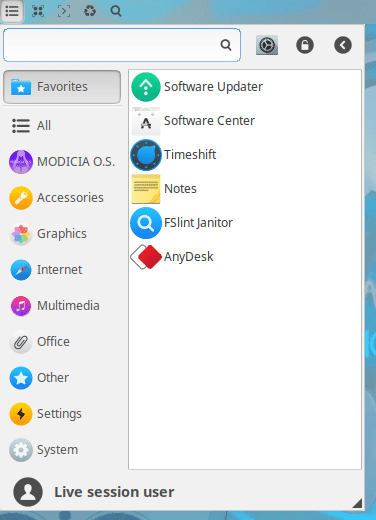 The center section is for thumbnails of the programs that are currently running and the right end acts like the system tray – composed of status and notification icons. The panel system is also quite compatible with Xfce applets. In the most of the modern distros, even if the panel is provided, they cut down the docking space for running apps and applet selections. Having the classic top panel and the macOS docking at the bottom, the overall user experience is just as thrilling as any distro can be. The menu option is clearly overpowered. It’ll take a little time to get used to it for any new user. Right-click on the name of any app in the main menu (top-left). There, you can manage whether the app should appear/disappear from the panels or even from the desktop itself! Every single behavior and functionality of all aspects of the system is controllable via a large number of control panels you’ll find in the main menu. If the default panel style isn’t suitable for you, there’s the Xfce Panel Switch for selecting among 6 other available options. 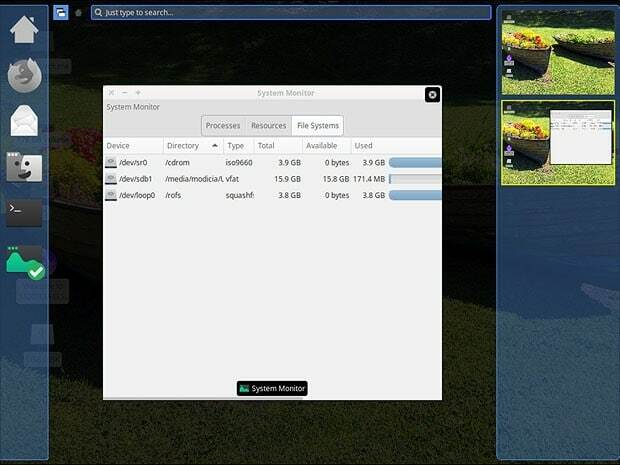 Modicia features the full-screen GNOME 3 menu display with the traditional two-column app menu. In the terms of performance, Linux machines always win as they’re lightweight and simple. However, you can take this a step further with all the available optimization tools packed in Modicia. The load up speed of programs is boosted through a software intervention on the usage of processor and RAM. Using the advanced mechanism, Modicia runs 25% faster than other systems, according to the dev. Modicia successfully compresses the data read and scanned in RAM. This allows avoiding usage of the swap partition, even boosting the speed up to 20%. If you like to rule over your system, then Modicia has plenty to offer. There is a good collection of cleaning, optimizing and maintain tools with nice GUI. No need to go through the confusing path of CLI (terminal and difficult commands). Modicia O.S. successfully represents its boastful “Ultimate” title. This is a true ultimate computing platform that’s ideal for any use – home usage or office works, even for heavy workloads like video editing and so on. I highly recommend people have the experience of this system. I bet that you’ll fall in love with it. It also has the potential to be one of the very top distros for general purpose. If you have several computers, it’s very nice to have one of them running Modicia O.S. to refresh you in your work and keep everything nice and refreshing. Modicia O.S. is a relative newcomer in the world of Linux, so it’ll take a little time to get matured enough. In the meantime, enjoy this awesome system. There’s no loss in giving a new distro a try, right?